Doug: Welcome back to the conclusion of our Legion 2-parter. Today we feature the back cover of the treasury-sized book in which I first discovered this story. 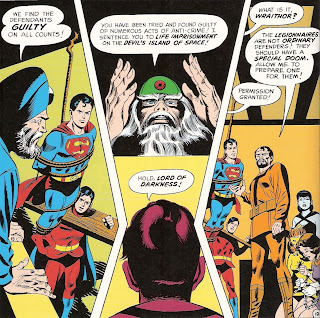 If you'll recall from Monday, four Legionnaires had fled to 20th Century Smallville in hopes of evading the wrath of the most powerful wizard of the 30th Century -- Mordru! But alas, that plan proved faulty, as the giant followed them and eventually flushed them out of hiding. Doug: Mordru's one angry cuss -- I mean what, lock a guy in an airtight vault with eternity the goal and that's not OK? Apparently not, because he zaps Superboy, Mon-el, Duo Damsel, and Shadow Lass pretty hard. 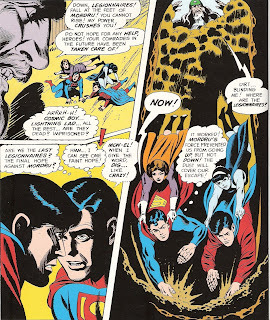 Superboy comes up with a plan: he and Mon will dig as fast as they can, tunneling away from Mordru. They're successful, and emerge several blocks away. 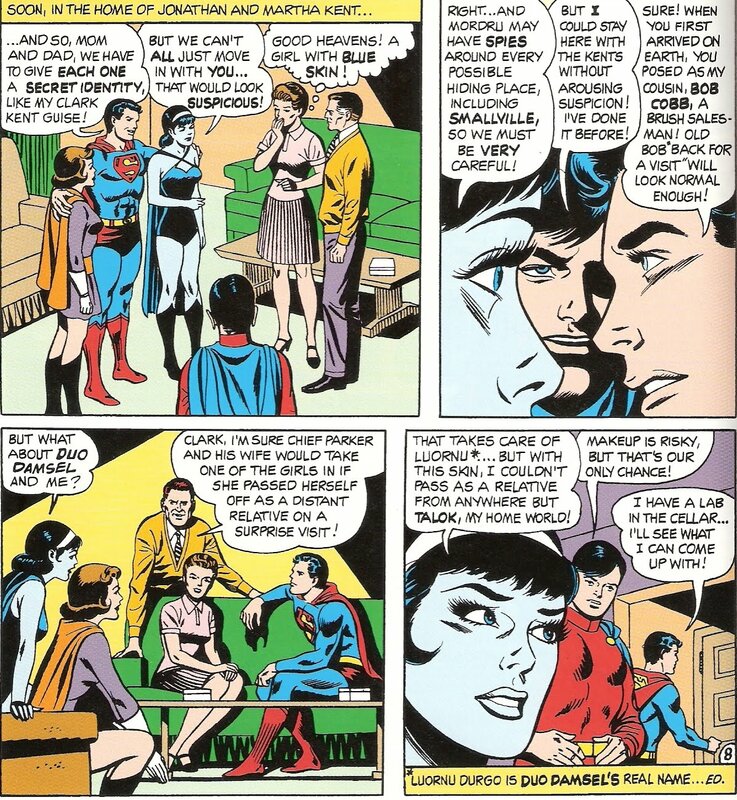 Assembling in the lab, Superboy uses a device to erase the knowledge that they are heroes not only from their own memories, but from the Kents' as well. After the hypnotism, all involved can't understand why they are in the lab -- it's been successful. Karen: At first when I read the plan, I thought,"Hiding again?" But when Superboy said the amnesia would wear off in an hour, I was relieved. 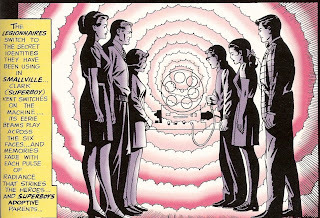 His hypno machine was pretty groovy, with its spinning wheel! It seems like back in the late 60s/ early 70s there were always hypnotists on talk shows or variety shows. 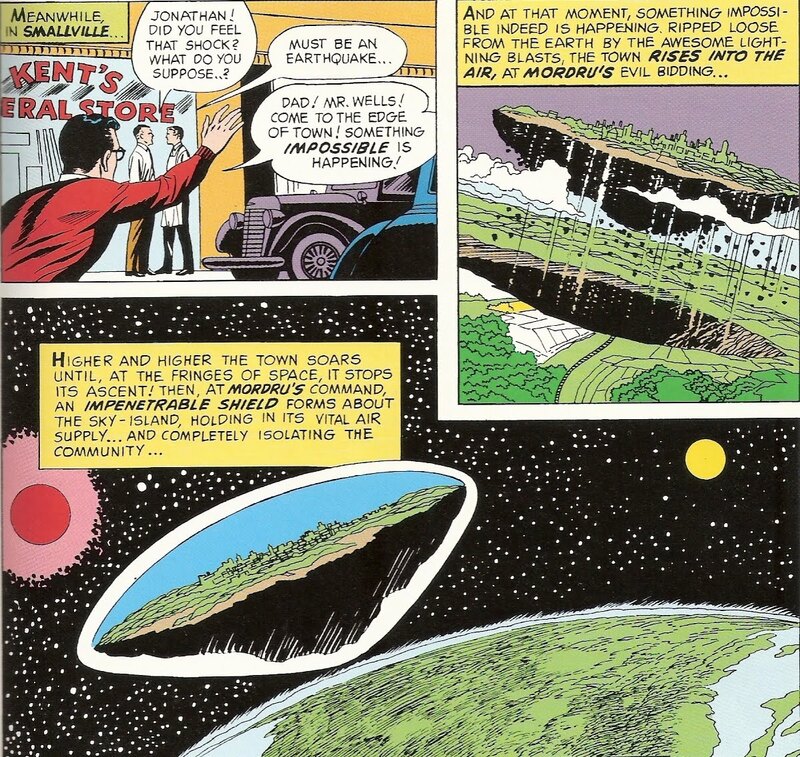 Doug: Mordru remains in Smallville, scanning the landscape (as well as the minds of the locals) for any hint as to the location of the Legion. 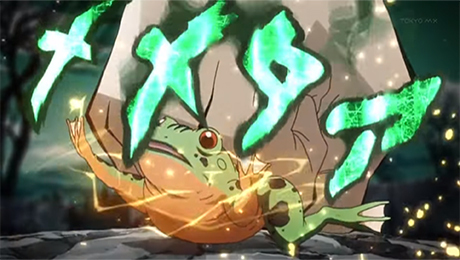 He searches recent events for clues, but having nothing concrete to go on he decides to try once again to force the young heroes out of hiding. Assembling his armies from across time, Mordru attacks the outer area of Smallville and lifts the landscape from the very face of the Earth (in a scene very similar to Graviton's ploy in Avengers #158-159)! After the levitating settles in, the armies do invade and attempt to bring the Legion to the fore. Karen: I was trying to recall where I'd seen that floating city idea used -good memory, Doug. Of course, Shooter wrote both of these stories! 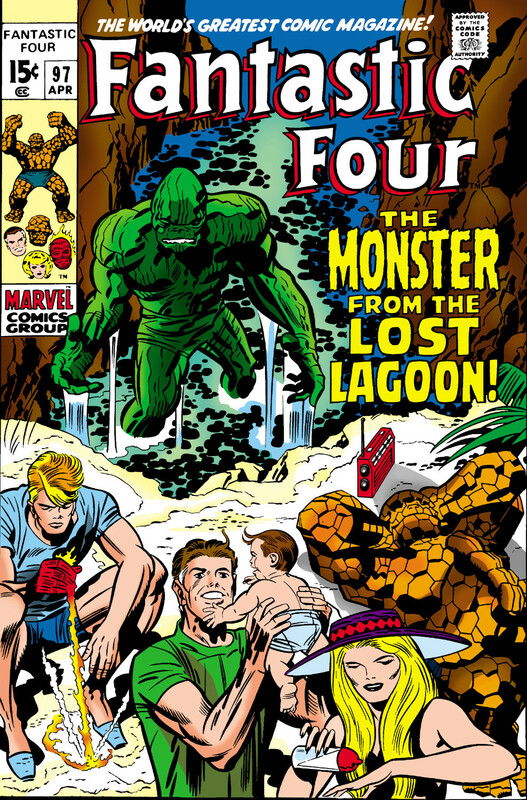 The only other one I can recall at the moment was the John Byrne Fantastic Four we reviewed not too long ago, where Terrax the Tamer did the same thing to Manhattan. Doug: You're kind, but really it's "bad memory" to me, because I've read that Terrax story way more recently than I have the Graviton story! 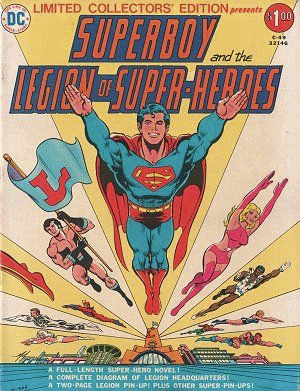 Doug: The Legion, strange as it seems, really has no predisposition to heroism. 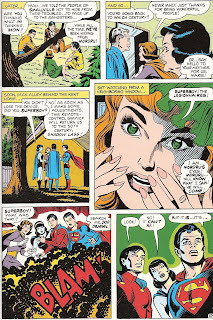 When threatened, the girls act timid -- well, except for Lana Lang who is as feisty as always. 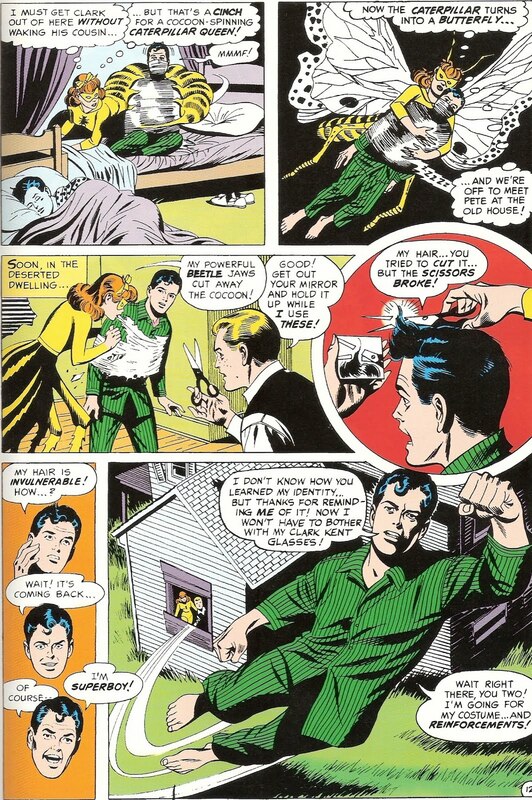 Pa Kent gets roughed up, and Clark admits that he's Superboy. The soldiers reject him, however, because they state that if he really was he'd have used his powers. Witnessing all of this from afar is Pete Ross -- Clark Kent's best friend who knows that Clark is Superboy. 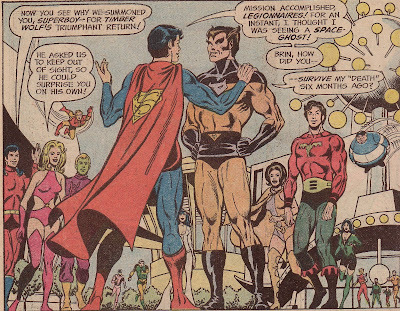 Pete goes to see Lana Lang, who he knows is really the Legion reservist Insect Queen. Pete gives up Clark's secret, and then asks Lana to kidnap Clark. Using her bio-ring to take the form of a fly, caterpillar, and butterfly she successfully brings Clark to Pete. Using a mirror and an ordinary pair of scissors, Pete attempts to cut Clark's hair. When the scissors shatter, Clark's memory returns and he flies away "for reinforcements". Karen: I had the same thought -it seems odd that without their powers or memories of being Legionnaires, the four of them become doormats. Pete and Lana come out looking like the real heroes! Doug: This was my first exposure to Lana as the Insect Queen, and for some reason I thought her powers were dumb. Saying that, of course, I'd seen (obviously) Spider-Man, and a Spidey Annual around this time featured the Fly. Lana just didn't resonate with me in this role, I guess. Doug: Clark gets the hypno-device and undoes the spell from everyone affected. Rejuvenated, the Legion attacks Mordru's army, but are soon captured -- or so it seems. Hiding in an alley, we find Superboy, Shadow Lass, and Insect Queen. Seems Pete Ross stood in for Superboy and Duo Damsel split and disguised herself as Shady, all in order to be captured. 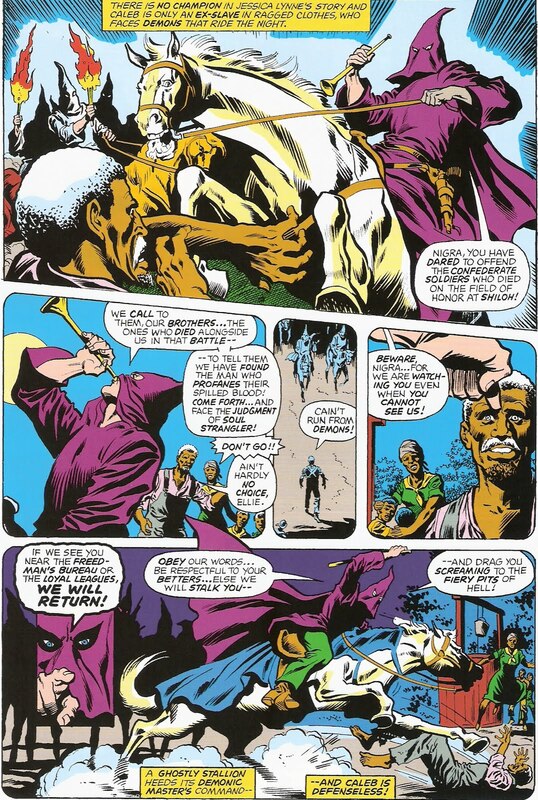 The captives are taken to the cave headquarters Mordru's set up, where they face the evil wizard. Suddenly, the real Superboy and his team burst in. Mordru's caught off guard, and the Legion does some damage. But it's not for long, and soon everyone is spirited away to a courtroom. Karen: There was great set-up for that attack, but the attack itself didn't seem too well thought out! Oh well, they're kids, right? 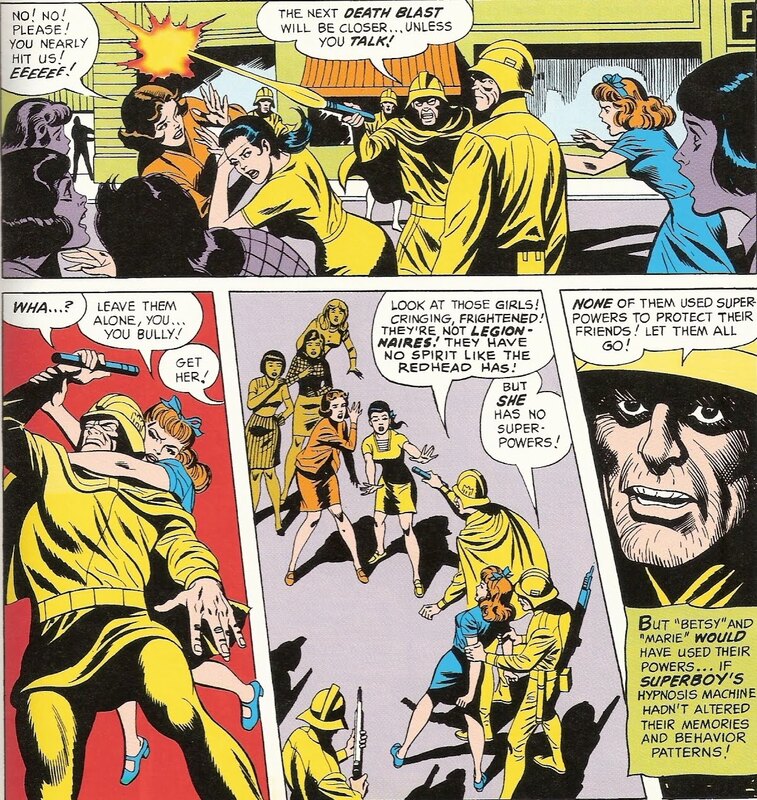 As an aside, I thought it was cute that Shooter had Mordru cast a spell referring to 'Yog Sothoth' -I guess he must have been reading Lovecraft back then! Doug: Mordru surrounds himself with some of the most evil do-badders of the 30th Century, although none we've ever heard of. A prosecutor states the case against the Legion, while Pete Ross speaks on their behalf. While Pete does his best, this is obviously a "show trial" and the team is sentenced to death. But before Mordru can mete out a method, the prosecutor Wraithor offers to come up with his own special doom. 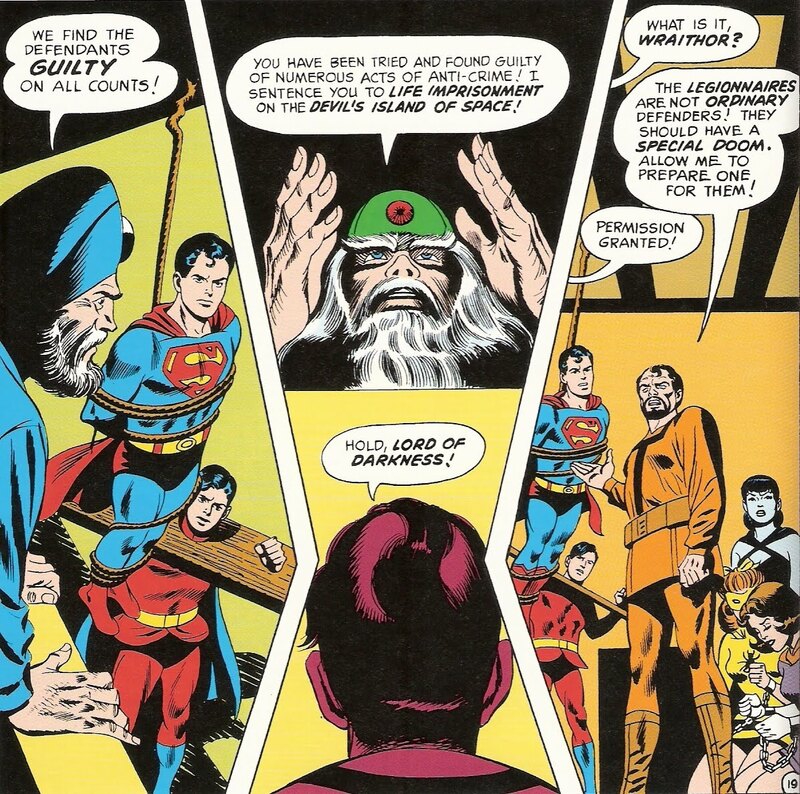 Alas, he's working against Mordru and rather than encasing the good guys in a kryptonite and lead-lined vault it's in reality a paper-thin chamber. 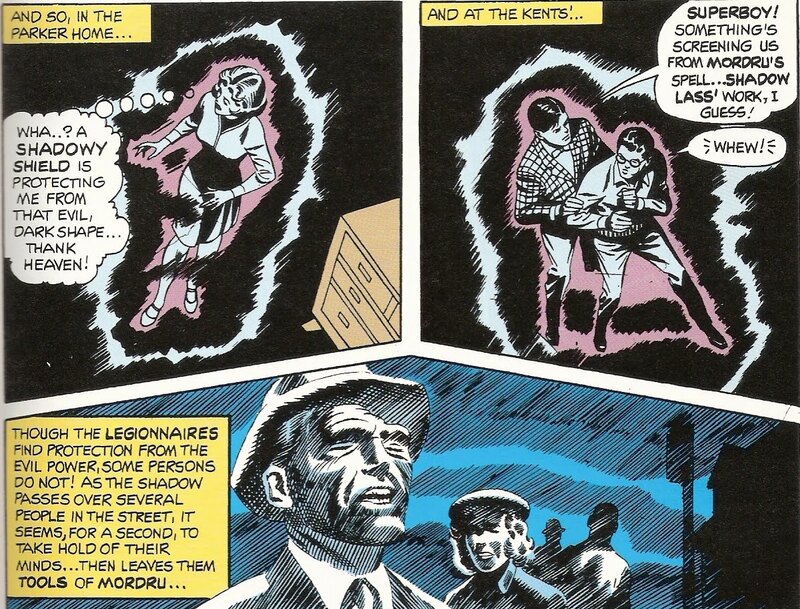 The teens break out and are met by their benefactor, who explains how Mordru had used him as a lackey. 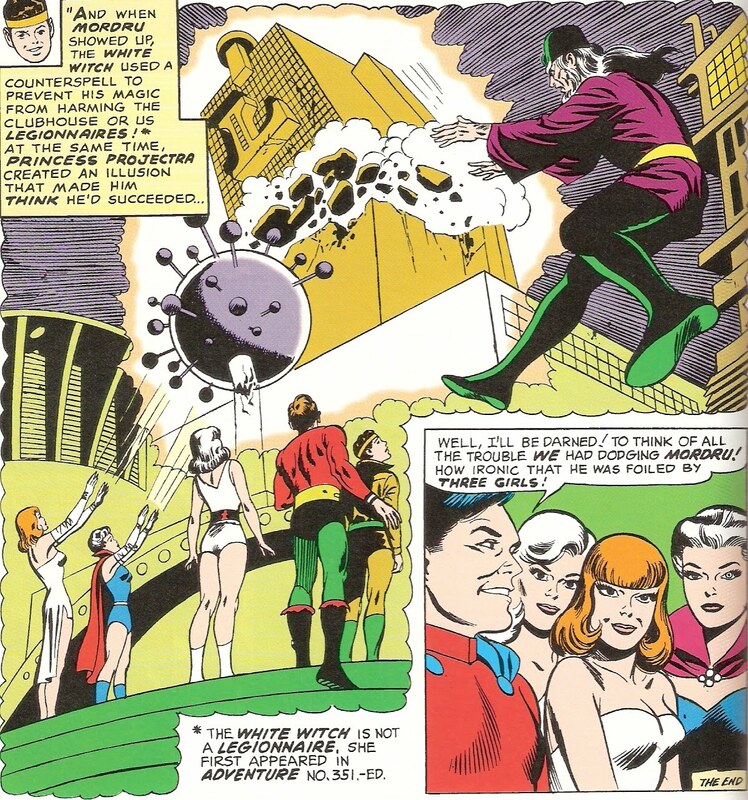 At that moment, Wraithor is vaporized and Mordru appears to confront the Legion. 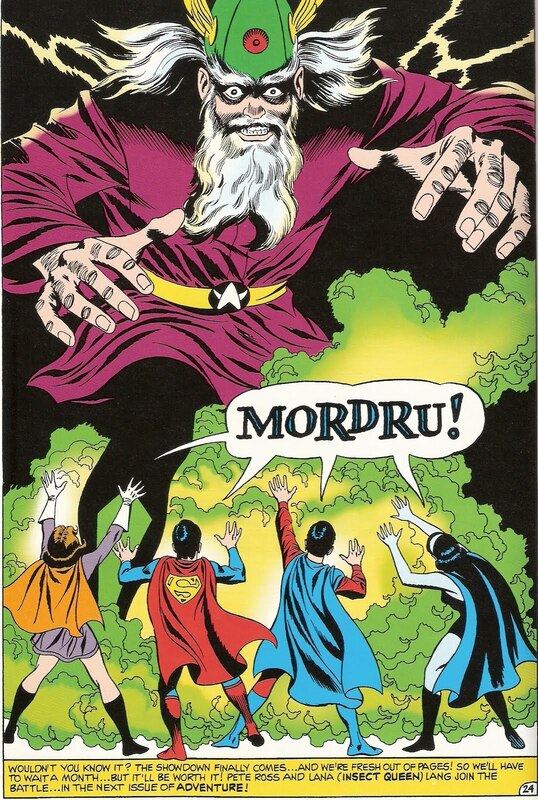 Doug: Encased in a forcefield of Mordru's making, the Legion are powerless. 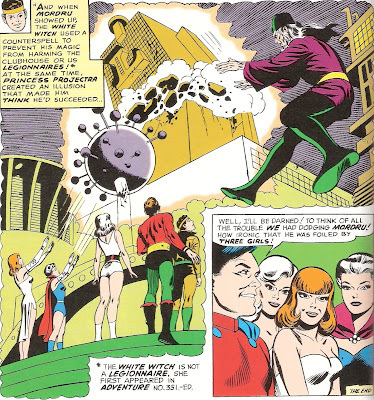 Mordru creates an enormous fireball, but the mass of the construct is too much and the cave begins to collapse on him. Ironically, it's the forcefield that protects the Legion. 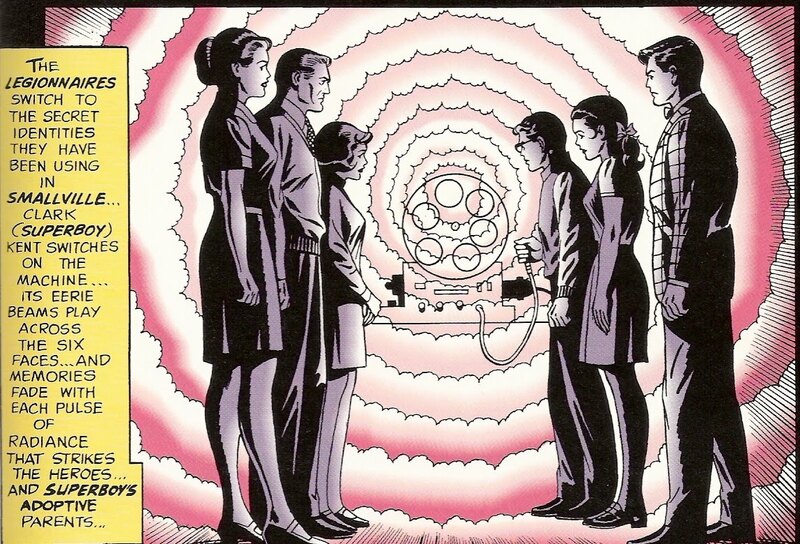 Once on the surface, they debrief and then head back to the Kents'. There, Superboy turns the hypnosis ray on Lana to make her forget his secret. 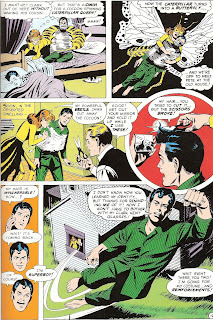 But when he attempts to turn it on Pete, Mon grabs it from him and turns it on Superboy himself. Mon can't tell Pete why, but tells the reader that in the future Pete will save Superman's life because he knows his secret ID. 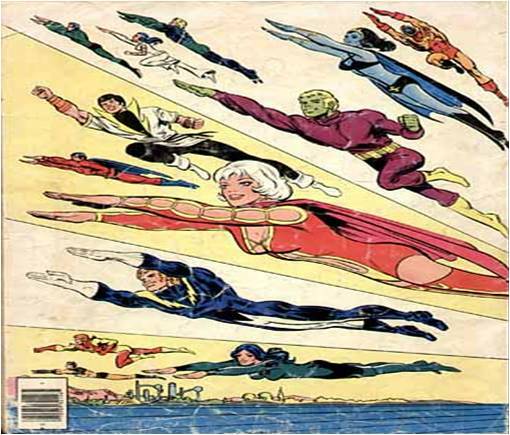 Back in the 30th Century, Invisible Kid, Dream Girl, and Ultra Boy relate how Dream Girl had prophesied the coming of Mordru. With help from her sister, the White Witch, and Princess Projectra, the Legionnaires were able to create an illusion that made Mordru think that they'd been destroyed. 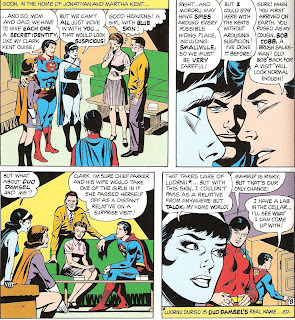 All's well that ends well -- until Mon-el has to go and ruin it with a typical Silver Age sexist comment -- "Well, I'll be darned! 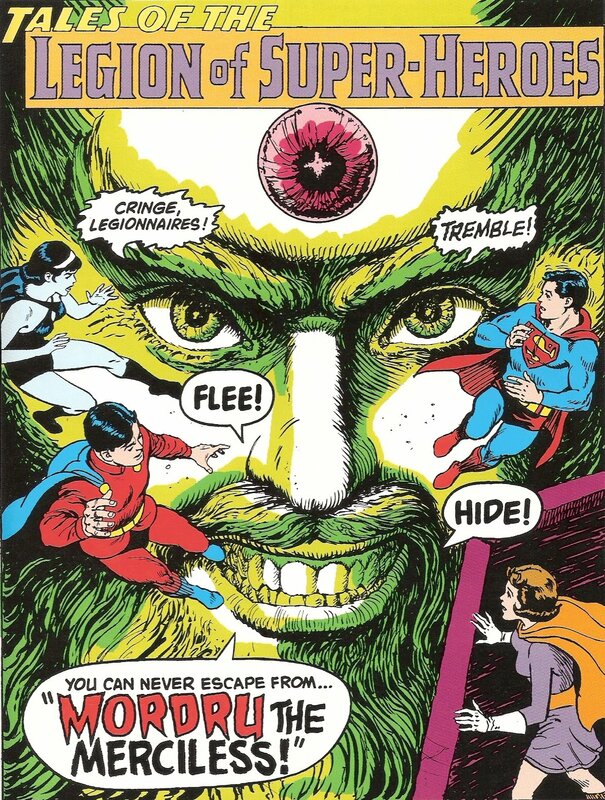 To think of all the trouble we had dodging Mordru! How ironic that he was foiled by three girls!" Karen: This was a fun little story, although I can't help but note that the Legionnaires prove to be fairly useless against Mordru. 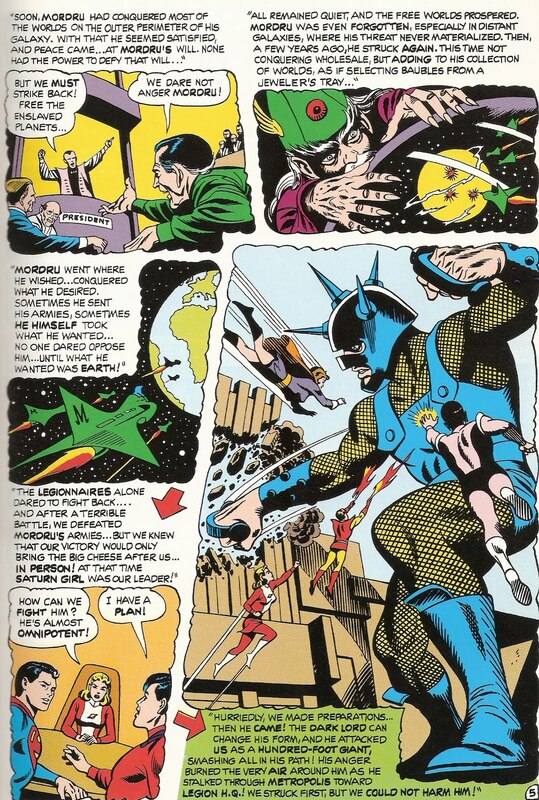 They were lucky that Wraithor helped them escape, and lucky that Mordru brought on his own downfall. 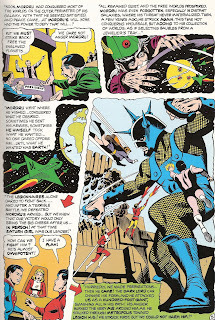 The 30th century team really didn't fare much better -they drove Mordru off but didn't defeat him. In fact he just went gunning for the Legionnaires still in the 20th century! This certainly wasn't their finest hour, but all in all, I enjoyed the story. What If Captain America and Bucky had BOTH been found alive by the Avengers? Karen: Who is your favorite teen-aged super-hero, and why? Anybody who started their career as a teen is eligible for this one. Karen: There are a lot of candidates -all of the Teen Titans, the Legion, New Mutants, original X-Men, and tons of solo stars, like Batgirl, Nova, and my favorite, good old Peter Parker, the Amazing Spider-Man. What is it about the teen-aged super-hero that makes him or her so appealing? Let's hear your thoughts. Karen: Or are there those you out there who can't stand teen heroes? Let us know why you feel that way too! Doug: Over the past week I've been reading and writing the review for our upcoming look at DC's Limited Collectors' Edition C-49, which reprints Adventure Comics #'s 369-370 from 1968. In issue #369, the Legion is faced with some organized crime-type thugs who take over Smallville. In the midst of the scene, the head goon says he has plans to take Metropolis next. Now, obviously it might seem a stretch to move from taking over a small town to a major American city. 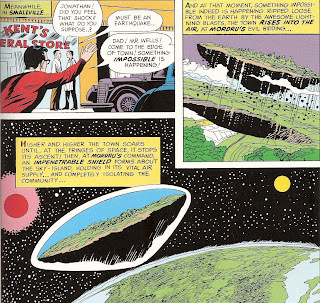 I was struck more with an issue of proximity -- if we are to believe that Smallville is in the middle of Kansas, as modern lore tells, and Metropolis is part of the Atlantic megalopolis, then it's a stretch to believe that such a plan would be on most baddie's radar screens. Doug: So, today's question is this -- who has the better universe? 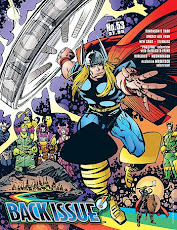 Marvel, set squarely in the real world with heroes centered in real cities like Manhattan and Los Angeles, or DC, with the mythical realms of Metropolis, Gotham City, Star City, etc.? Does either scenario cause problems for the creators and/or the readers? As always, thanks in advance for your participation. 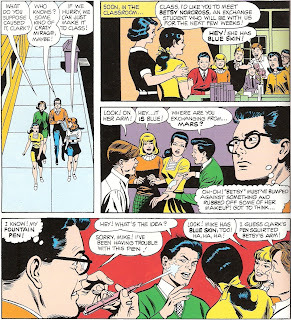 Doug: And come back next week, as the Bronze Age Babies celebrate teenagers in comics -- two issues of the Legion with an Open Forum in the middle! And for your additional weekend reading, Shooter has a post about Legion weddings (dated 9/22/11) for your perusal. 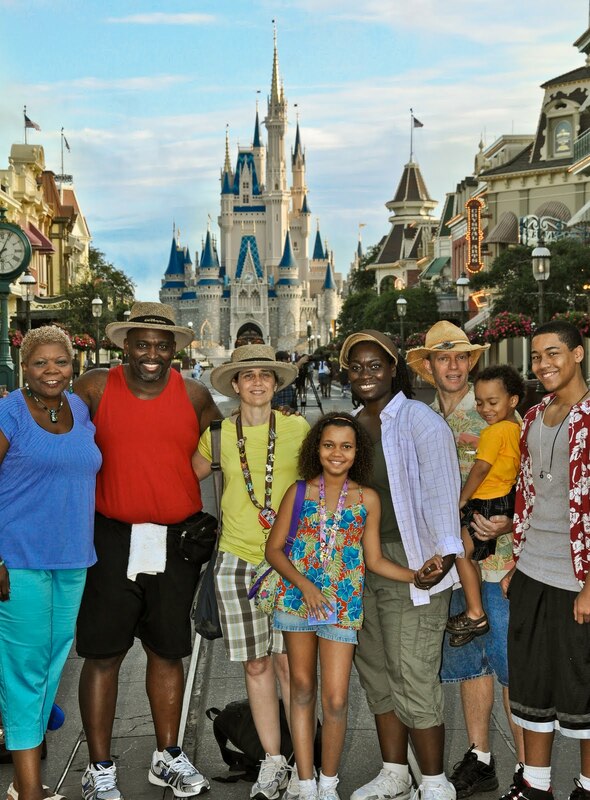 Karen: Doug wasn't the only one to go to Walt Disney World this summer. I went for 9 days with my husband at the end of August. This was my second time there, the first time being with my husband in 2009. I was amazed the first time at how much it had to offer, beyond the typical rides. I grew up in California and have been to Disneyland half a dozen times or so, but as much as I love Disneyland, there really is no comparison. Someone once described it thus: Disneyland is charming, while Disneyworld is mind-blowing. Karen: The big difference this trip was that we would not be alone; at the start of our trip, our group consisted of twelve people! Besides my husband and me, we had two of our close friends and their teenaged girl and her boyfriend (they stayed all 9 days). For the first four days, we also had six family members: my husband's mom, his sister, her husband, and their three great kids, two boys aged 4 and 15 and a girl aged 10. So you can see we had quite a crew! One thing I learned: it's very different coordinating a trip with two adults than it is such a large group of diverse ages. But despite some difficulties, everyone seemed to have a fine time. I should give some credit here to my hubby, who took all the pictures you see here except for the family one. 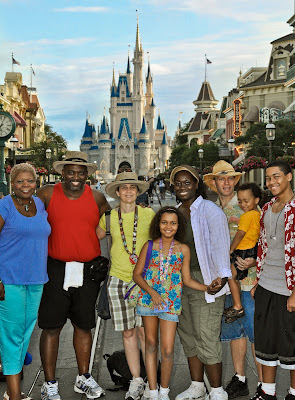 Karen: We stayed at the Polynesian Resort, which I absolutely adore. I'm a big fan of tiki-style, and this place has it in droves. My husband has also become a fan and one of our pals is a major tiki guy (he even built a tiki bar in his house) so it was pretty popular with the group. It didn't hurt that when we entered the lobby they g ave us -free! -fresh, hot chocolate chip cookies. Another big plus of the Polynesian is that it is on the monorail system and the transportation center is right next to it, so it is very easy to get around. Karen: So much of the trip has blurred together, I won't give you a day by day run down, but instead focus on some highlights. First up, we had some really good meals. I know, you're probably thinking "park food?" but Disney has some very nice sit-down options. Heck even some of the fast-food options are pretty good. The hands-down favorite meal for everyone was at the Polynesian, at the Ohana restaurant. This was simply fabulous. It is served family style, and you start off with platters of pineapple bread, salad, noodles, pot stickers, and sticky wings. Then they bring out the skewers loaded with grilled meats. Steak, chicken, pork, shrimp -whatever you want, as much as you want. Delicious dipping sauces are provided. My husband and I felt the pork was the best, but you couldn't go wrong with any of those choices. The whole meal was topped off by a gooey bread pudding and vanilla ice cream desert. Can you say stuffed? Other great meals were BBQ at the Whispering Canyon Cafe at the Wilderness Lodge resort, Mexican food at La Hacienda in EPCOT, and burgers at the Sci FI Dine In in Hollywood Studios. 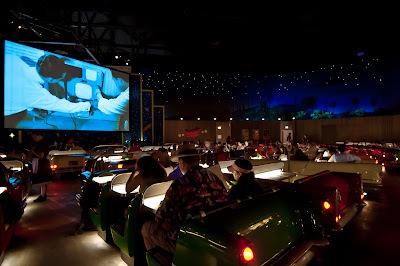 The Sci Fi Dine In is an indoor restaurant designed to look like an old school drive-in theater, complete with movie screen showing trailers from old science fiction B movies, and the tables are cars! As you can see from the picture, it's a gas! They had terrific burgers and the best desert we had on the trip: chocolate bundt cake filled with warm peanut butter! Out of this world. Karen: As Doug mentioned, Animal Kingdom always seems the most hot and humid of the four parks -probably because of all the foliage. But we got on the first safari of the day one morning and saw a ton of animals. The whole experience is really well designed (just what you would expect of the Imagineers) so that you think there is nothing separating you from the animals as you drive through their habitat. We saw giraffes, rhinos, hippos, elephants, and even the lion and lioness. It was amazing. Karen: The Haunted Mansi on is always a hoot. It seems like every time I ride it, I see something new. As you enter you have the option of going through the regular line, or a line with some interactive exhibits. These features are a lot of fun, especially for the kids. 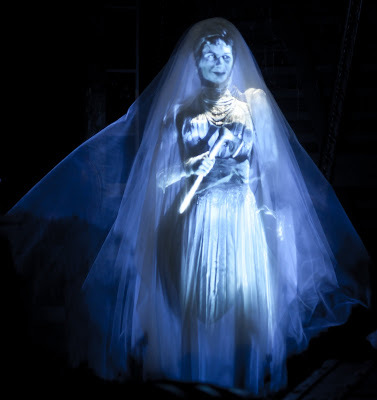 You get to interact with the spirits by pulling, touching or standing near certain items, like headstones and tombs. A great way to break up the monotony of waiting -although we rarely had a wait longer than 20 minutes for any ride. They've juiced up some of the interior scenes from years ago -for example, Madame Leota's crystal ball moves around the room now. The Bride in the attic is also a heck of a lot scarier. Karen: My husband and I and our friends went to the Spirit of Aloha dinner at the Polynesian one night. This is a dinner show. The first part of the show is very cheesy, with 'Auntie' and her nieces and nephews preparing a going-away party for 'Leilani'. But the second half is very entertaining as it features performers in costume doing Polynesian dances. The headliner is the fire dancer -this guy was unbelievable. 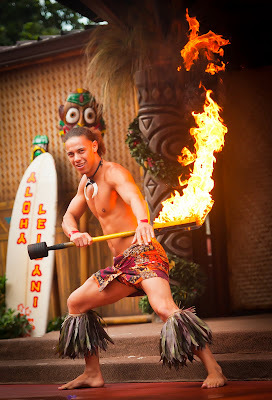 He spun flaming torches around and breathed fire. Absolutely amazing. The food was just OK. I don't know that I'd do it again, as it was about $50 each, but I don't regret seeing it. 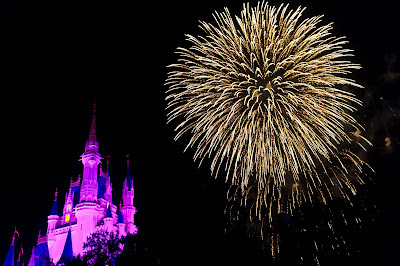 Karen: The Magic Kingdom firework shows, which are nightly, are always spectacular. We saw them from both the park and from the beach at the Polynesian -it is across the lagoon from Magic Kingdom. The great thing at the Polynesian is they pipe in the music that is synchronized with the fireworks. Karen: I saved the best for last. We got to ride the new Star Tours ride six times! Twice one day, and then four times in a row another morning. When we were at the park in 2009, we rode Star Tours and both my husband and I turned to each other and said, "They really need to improve that ride." Improve is an understatement. This ride is simply fantastic! You get a different experience with each ride, as there are now 2 different beginnings, 3 different middles, 3 holographic messages, and 3 endings. We got to experience all except one of the endings. They've incorporated many favorite Star Wars characters into the ride now and you really feel like you are in the Star Wars universe. The 3D effect is also very well done and not intrusive, nor are the glasses uncomfortable. 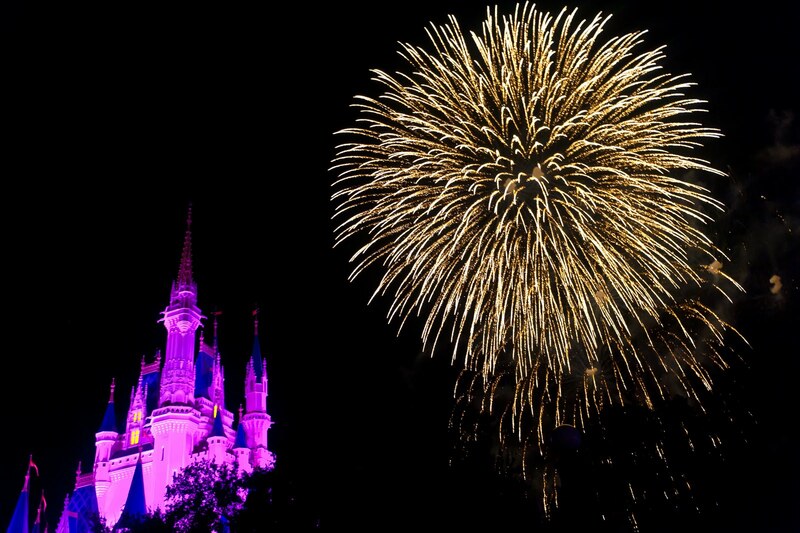 This is a definite must-do if you go to Disneyworld. Karen: There's so many things we enjoyed; this is just the tip of the iceberg. Even though we had 9 days there, we still didn't get to do everything we wanted. We really wanted to see Festival of the Lion King but the times never worked out. We also only spent one night at the World Showcase, and we never made it to Fantasmic either. But that just leaves some things to do when we go back. The family is already talking about a 2013 trip. Hopefully our bank accounts will have recovered by then! Doug: Just to close out our Disney series, I just saw on the news that Disney has won the rights to build attractions at their theme parks based around the film Avatar. You can read about it here. Doug: In the past during some surveys we've run, many of you have said that the Blog Archive feature on the sidebar is where you most often head for some spelunking. A glance over there will show that we've for the most part been a daily blog since July 2010. That's a lot of posts! And we've been faithful through our own vacations, illnesses, and creative lapses. But Karen and I have always attempted to maintain a passion for this blog and our daily audience, especially our regular commenters -- you 20-or-so readers are near and dear to the BAB community. That being said, we have decided to pull back a bit for the time being. Doug: For me, this has definitely been a labor of love -- I've said that often. But lately, and I hate to confess this, I've hit somewhat of a creative wall. I've expressed this to Karen that sometimes when I sit down to write it just doesn't come easy (cue the George Harrison version of It Don't Come Easy). And it has affected the pace of the blog. If you could see the queue, it is sometimes built out over a month in advance. Lately, we've been catching up to ourselves, and that has perhaps created a bit more pressure to bring our product on a daily basis. So, after an editorial board meeting over the weekend, we've decided to go back to our original imagining of the Bronze Age Babies -- posts three times each week. Karen: I have to echo Doug's sentiments. I love the blog, love getting up each morning and checking everyone's comments, but lately there's been a lot going on that's dividing my time. I have to say my blog partner has taken on more than his share of work here, for which I have been grateful. But going back to our three a week schedule will help us both. Doug: We hope this scheduling change won't affect our readership, which is pretty strong. We would hate to feel like we are letting down any of the almost-300 people who call this a home on a daily basis. But in order to maintain our high level of quality, a scaling-back is necessary. You can still look for all of our regular features -- they'll come along, as they always do. 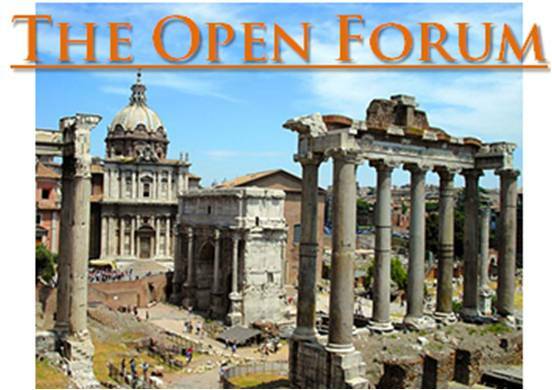 But as a way to get your fix, we'd definitely encourage going back through some of our many comic book reviews and other topics, like the Open Forums. Go ahead and make a comment, even on an older post -- we'll see it. There's no reason for an old conversation to be "dead". Karen: There have been a number of times where people have revisited an older topic and brought a new perspective to it, which is always nice. Doug: And thanks so much for the interaction over the past 26+ months. 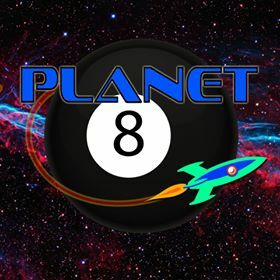 This is really a fun place to hang out -- we look forward to the comments rolling in as each day goes by. You provide a service to us as much as we hopefully do for you. "Death Riders on the Horizon!" Doug: Uh oh. The teaser at the end of Jungle Action #21 said T'Challa was going back to 1876 to fight the Klan. In the midst of a story about social justice, can that be good? And what's more, when I look at the credits, I see that Billy Graham is not alone on the art chores -- witness Rich Buckler and Jim Mooney creeping into our cast of creators. 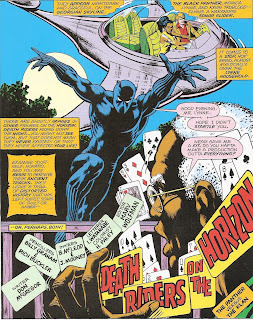 Something is amiss here in part four of our look at the mid-'70's Black Panther series. Karen: The switch from the Graham-McLeod art to the Buckler-Mooney art is jarring. I have to say most of my problem is with Mooney's inks. After McLeod's tight, detailed inking, Mooney's thick brush-strokes look odd. Doug: And, right from the splash page I'm a little disarmed. 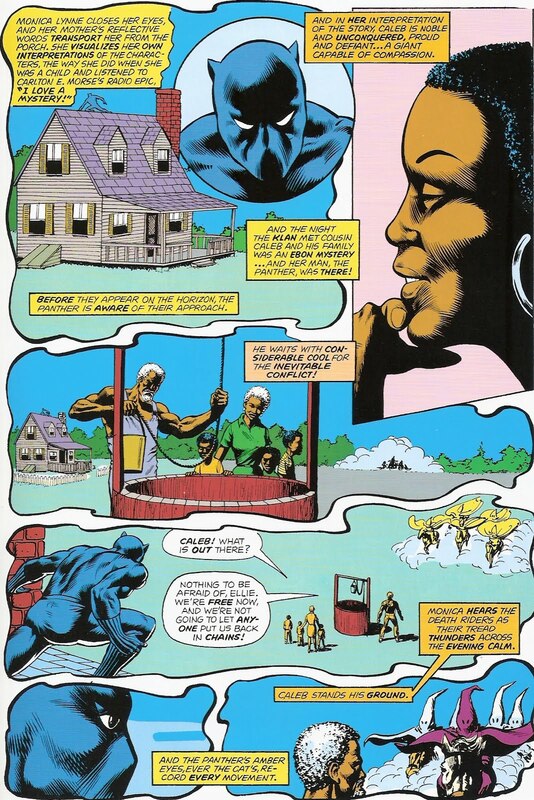 We see T'Challa leaping onto the Lynne's front porch, from a Wakandan cruiser. And piloting the cruiser? Monica Lynne, along with intrepid reporter Kevin Trublood. OK, this isn't cool. 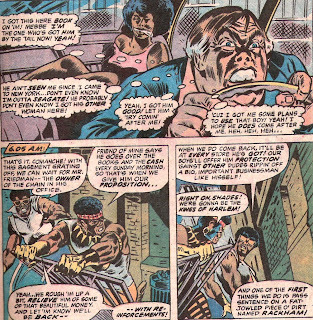 We've come through three issues of somewhat-urban action with T'Challa -- no tech, no overt superhero powers. Just a guy wanting to set things right against the evil of the Ku Klux Klan. That seemed to be the way to go in telling that story. But now? Easy boy... OK, I'll try to be civil as we go through this. Karen: It was kind of an odd choice, but then again, we've also discussed how it seems strange to have the Panther in his costume all the time. 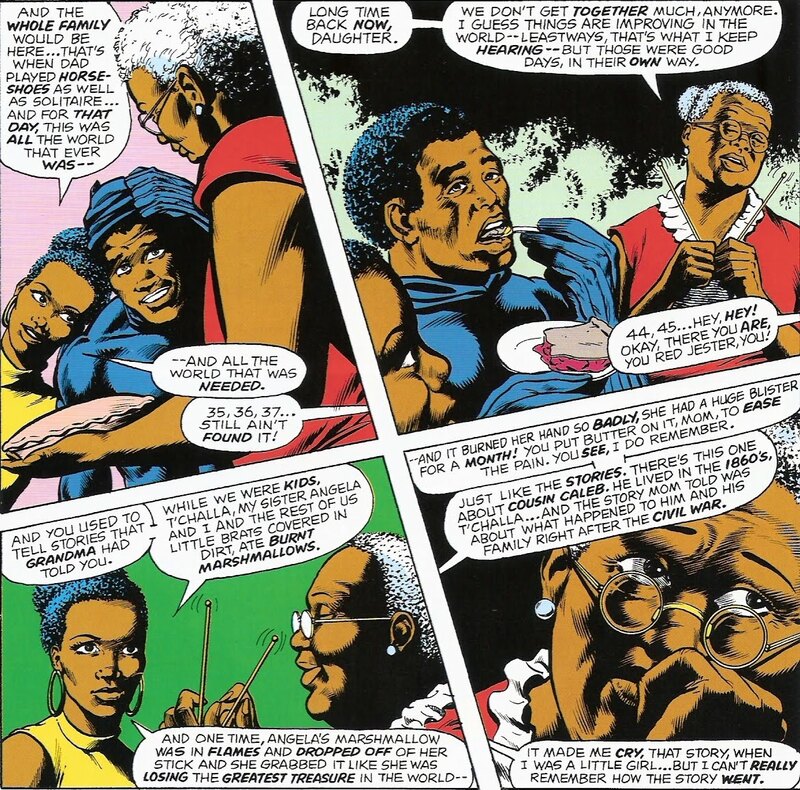 Doug: As we turn the page, there's just some simple banter among the Lynnes (including Monica, now landed), Trublood, and T'Challa. It's actually sort of fun, the slice-of-life aspect of it. Monica and her mother remark how they used to get together as a family all the time, to roast marshmallows and tell stories of the past. Monica thinks back to a story about a Cousin Caleb, and his fate after the Civil War. Momma looks pensive as Monica urges her to tell it now. Doug: McGregor now weaves a strange tale, each part told on two pages: on the left, history as Mrs. Lynne remembered it. But on the right side of the magazine, we see Monica begin to daydream, and fantasize, about the same story. 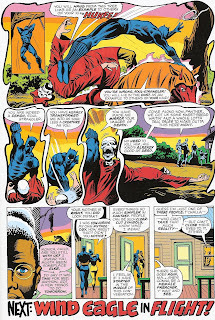 And here is where Buckler and Mooney come in (the eyes are where you find Jim Mooney's inks -- unmistakable! ): they illustrate Monica's version of the story, which includes T'Challa in the Old South, to save the day. 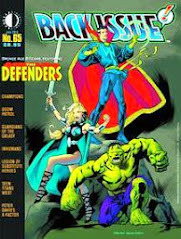 Karen: Hey, wouldn't it have been cool if they'd had Graham and McLeod illustrate the 'real' story while Buckler and Mooney did the 'imaginary' one? Doug: Caleb was now a freedman in 1867, yet without education or much to show in his name. One day a band of hooded men rode near his home, a beaten down old shack. Monica saw a nice homestead, complete iwth windows and a cellar. 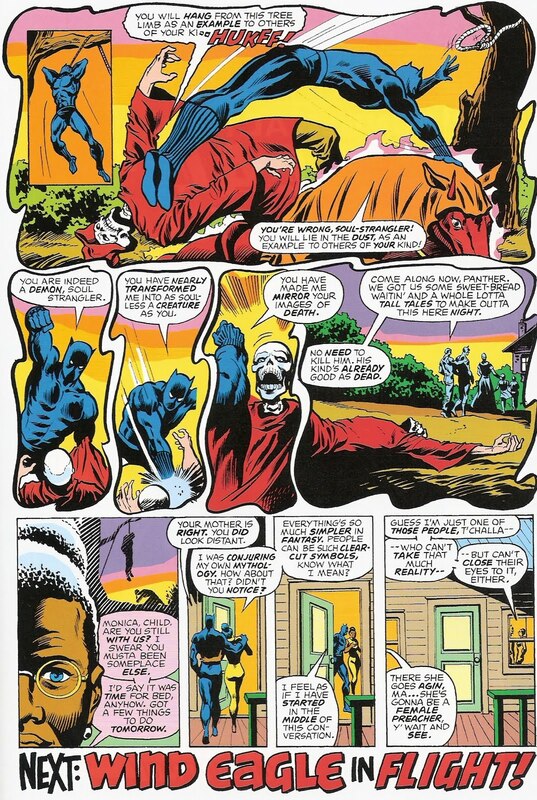 And as the Klan arrived, the Black Panther was waiting to greet them. Karen: Monica's idea of Caleb's 'shack' looks very much like her own home. Doug: Caleb was afraid of these riders. And they yelled at him and warned him not to go to the Freedman's Bureau or the Loyal League. If he did, he'd know the wrath of the Soul Strangler. Monica saw Caleb stand up to the Klan, and as they rose to strike him down, a black bolt descended like a missile from the trees. Karen: Monica's Caleb is also tall and muscular, much like her super-hero boyfriend. Doug: Caleb made his way to the Freedman's Bureau anyway. Surely someone would help him. But what he found were two white men who only wanted his vote. Now able to cast a ballot, the black vote became worth something to white politicians seeking to better only themselves. Monica saw Caleb being taken advantage of, but a hero burst into the room and put the white men in their place -- depositing them on coat hooks to dangle there while Caleb and the Panther had a laugh -- and exited declaring that they'd confront the Klan as individuals. Doug: Caleb and his wife and their kids hurried back to their home, trying to make it before darkness fell. The sound of horses overtook them before they even got close. Monica closes her eyes -- if T'Challa had been there, the Klan would never have had a chance. Doug: A man in a red robe and hood rode up to Caleb, and extended a skeletal hand. Caleb took his hand. The man informed him that he had died at Shiloh, and that he and the rest of his men were spirits. Caleb was then to turn around and meet his executors. Monica knew the Panther wouldn't back down from this Soul Strangler, and he didn't. Karen: I thought it was a nice touch that in Monica's fantasy, the Soul Strangler's horse was red and aflame. Doug: The Soul Strangler dragged Caleb over to a tree, where the rope was thrown over a strong branch. Caleb's body was pulled higher and higher, and tied off. It was there that he died. Monica knew the Panther would work against the noose, and find a way to defeat the Soul Strangler and his henchmen. 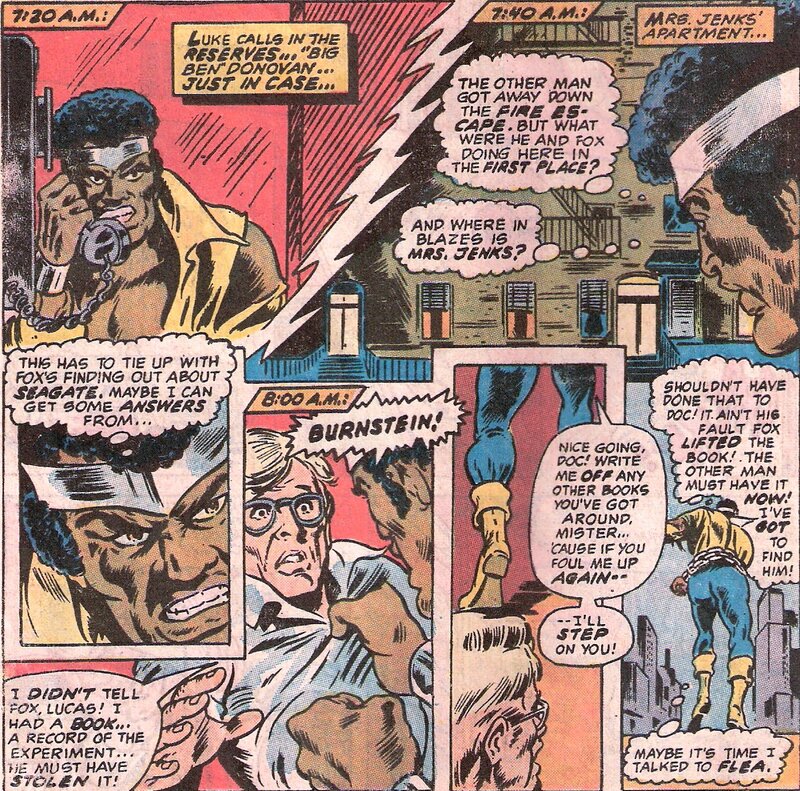 T'Challa beat the men into submission. Karen: Monica gives her version a nice happy ending, something that unfortunately never happened for Caleb and many like him. Doug: Before we wrap this one, I have to ask -- what did you think of this dichotomous story? To be frank, I found it offensive. I think I know what McGregor was going for, but it comes off as a real slap in the face to a people who were powerless to change the course of their history. Monica attests that she was indeed having a fantasy, but it's still a bit distasteful to me. Karen: Hmm, I didn't actually have a problem with it. I took it on face value -Monica simply couldn't handle this terribly sad story, so in her mind, she re-wrote it, making her ancestors triumph in the end. It's simplistic but I think it's not unrealistic -haven't we all rewritten some episode from the past in our minds, as a daydream, trying to turn failure into success, or sorrow into joy? I don't feel any sense of disgust or contempt for Caleb -we all know that in the real world, these things happened and their was nothing one man could really do. I'm actually more concerned that this issue does nothing to move the Klan storyline ahead. That would have been fine, if we were going to get back to the story in the next issue. But that didn't happen. Doug: I don't know that I have any contempt for Caleb -- he played the hand he was dealt. I guess I'd like to know if Don McGregor was making any criticism of his own, through Monica. It just struck a chord with me, I guess. Doug: Well, as some of our commenters have mentioned previously, this one didn't get finished before Jungle Action was cancelled. Although Jungle Action lasted two more issues, #23 was a reprint of Daredevil #68 and #24 began a new tale -- yet written by McGregor! And what's even more puzzling is the fact that the ending didn't appear for another 3 1/2 years! 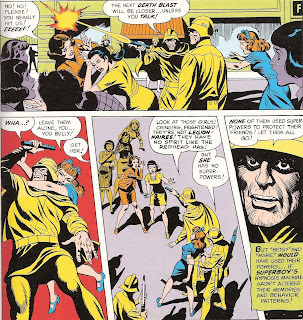 And, when wrapped up, it was written by Ed Hannigan and drawn by Jerry Bingham -- I'm talking about Marvel Premiere #'s 51-53. Weird... I don't have any of those (although at one time I did have #51 -- I recall that it was actually the conclusion of JA #24 with a dude named Wind Eagle), so any of you who do and want to give us a quick synopsis, feel free! It would be welcome! Karen: The Wind Eagle story does include the Dragon Circle, and gives some more insight into Angela's death, but that's it. Now I feel like I need to find those Marvel Premieres. 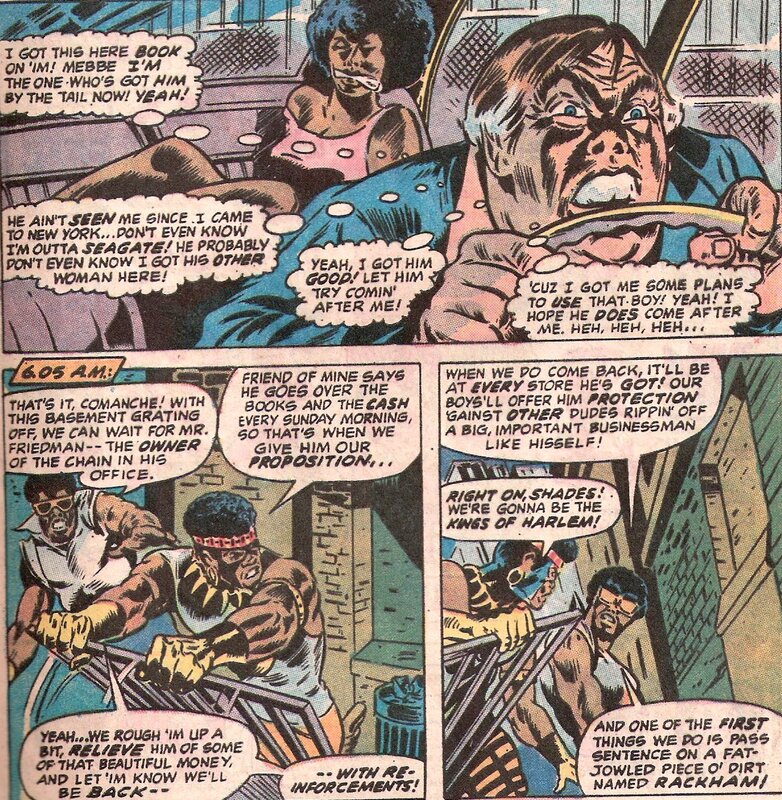 I also feel that perhaps we need to review some of the Panther's Rage issues, seeing as how that storyline is so highly regarded. Doug: I can't tell you how cool it's been spelunking through the two reader lots I've won over the past few years on eBay. 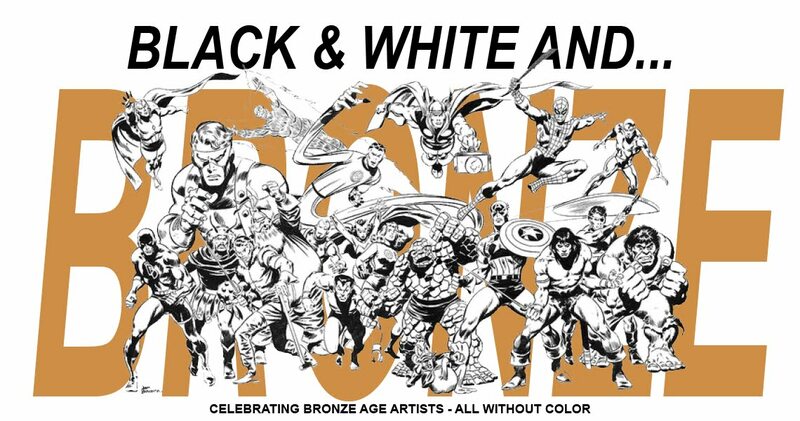 I've gotten a lot of mileage out of those, bringing Bronze Age love to you every so often. 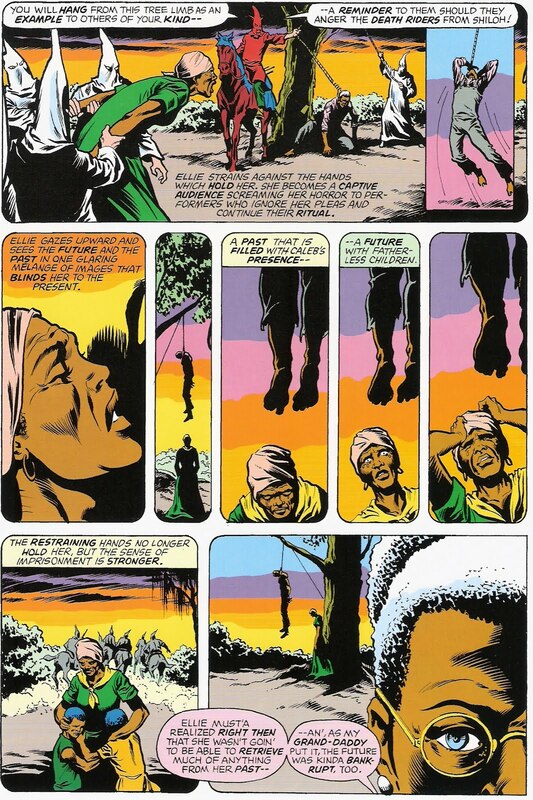 Here's one -- we've been digging on Billy Graham's pencils in our 4-part look at the Black Panther in Jungle Action. I saw this one in the pile, noticed Billy credited, and grabbed it. 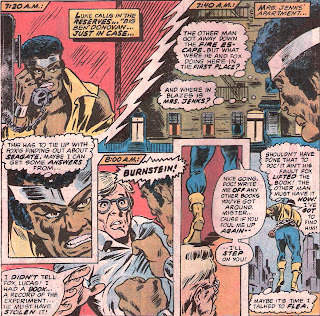 Let's see what he looked like on Luke Cage a few years prior to the arc with T'Challa we've been enjoying. By the way, how about the writing credits? Three guys? Hmmm... wonder if there will be too many cooks in the kitchen? We shall see. Doug: To begin, I always like to do a quick page-through, mainly to see the organization of the book, see where the Bullpen Bulletins and letters pages are, check on the Marvel Value Stamp when applicable, etc. I was very surprised to see that this has two stories in it, and one's a reprint (a 1954 Sub-Mariner yarn by Bill Everett, or all things)! As this is part two of a story, and upon checking I found that the previous issue was all one tale, I wondered if perhaps this story may have been intended for a Giant-Size book. Well, so you don't have to look it up, I did. I found that Giant-Size Power Man (the book is still Hero for Hire here) wasn't published until 1975, but did indeed include this entire story! How's that for irony? Not bad when you can be right and wrong with the same thought! And before we even get into the story, I'm going to say up front that Graham's art doesn't look as polished as it did in the Jungle Action books -- here it seems to have a bit of a caricature-look and feel. I'm not saying that's bad -- just my first impression, that it's different. OK, enough pontification. Doug: Wow. Just wow. After the splash page, I'm wishing I had the previous issue. This one looks like it's going to be good. 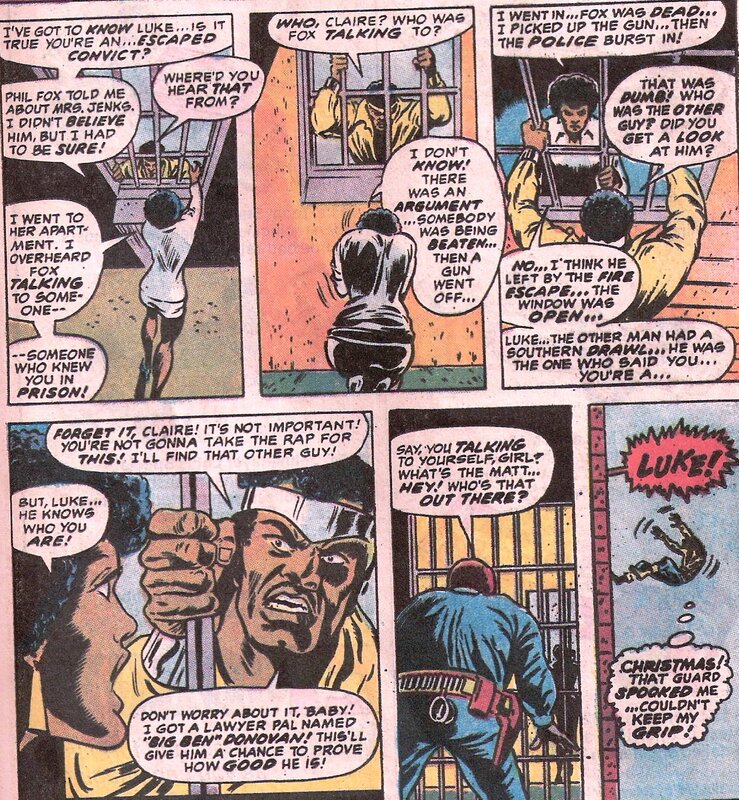 Seems everything that's gone on in Luke Cage's life has come to a head at the same time, and it's not looking so hot for him. Complicated, but not positive. The writers really tell a rapid-fire story. The evil guard from Seagate Prison, Rackham, has come to New York to ruin Cage's life. He's brought along a Dr. Fox, but apparently in the last issue Rackham accidentally killed Fox. 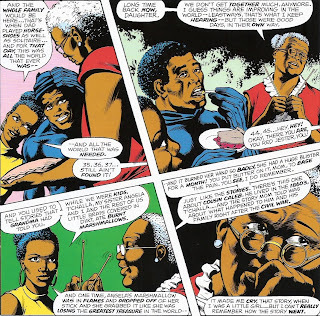 They had kidnapped a young black lady who they thought was Cage's girlfriend; she saw Rackham kill Fox. 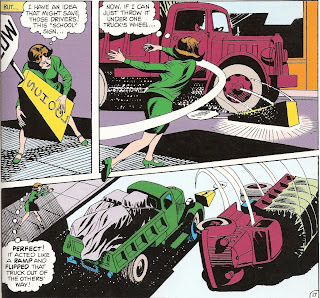 After Rackham had fled with the girl, Cage's real girlfriend, Dr. Claire Temple stumbled on Fox's body at (you guessed it) the exact moment the police arrived. So she's taken to jail. And on top of all of that, the second and third men to ever bust out of Seagate are on the prowl as well, and about to break into a liquor store in Harlem. Doug: So Cage, in his office, gets word that Claire's in jail. He ain't happy, so heads to the precinct. The cop on duty gives him the business and refuses to let Cage see Claire. Moving outside, Cage goes to the top of the building across the street from the lock-up, and leaps from one roof to the other. Then making like Spider-Man, he climbs down the wall to the 6th-floor, where he knows Claire is held. Cage gets lucky and finds Claire pretty quickly. She is able to tell him what really happened with Fox's death, but as they talk a guard comes by her cell. 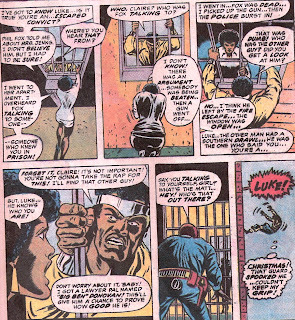 Startled, Cage loses his grip on the bars and falls the six stories to the ground (shouting "Christmas!" as he takes his leave) -- but fortunately lands on the roof of a passing bus. Doug: And that's where it ends! Man, why isn't this story longer than 11 pages? It does conclude in Hero for Hire #16, which is the last issue before the title switches to Power Man. So, I am soliciting any of our readers who can fill us in on the before and after of this short tale. It was really engrossing, albeit a bit confusing since I was literally dropped right into the middle of it. Help a brother out, please! Doug: Oh, I'd better finish my evaluation of the art. It is definitely different from what we've been seeing in Jungle Action, but it's not bad. 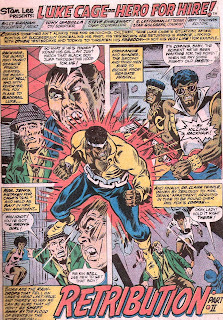 It's funny, because I sometimes associate Luke Cage with George Tuska -- there's a bit of a Tuska feel to this. I actually got a little Frank Robbins vibe. But it's pretty good stuff. 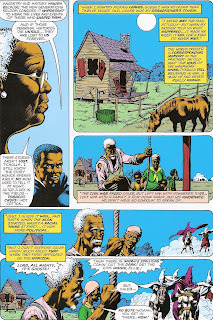 The writing is fun, too -- you can feel the "blaxploitation" era, for sure! Karen: Today yet another brand new, completely revised version of the Star Wars saga is hitting the shelves, and once again, Mr. Lucas has felt the need to change things. Now, people have been discussing these changes for weeks, but we haven't talked about it here at BAB. So let's lay it out there -what do you think about even more changes being made to these films? Karen: I'll get things rolling by discussing a few of them. First off, we're getting a completely CGI Yoda in The Phantom Menace. Now this doesn't bother me, as 1) I think CGI Yoda looks better and 2) I will never watch that movie ever again. Honestly, I despise that film. Karen: But the change that has drawn the most criticism is the "Nooo!" added to Vader's scene in Return of the Jedi, when he saves Luke. Horrible, and completely unnecessary. Plus, it sounds just like the "Nooo!" in Revenge of the Sith, which provoked laughter in the theater. Why George, why? Karen: So - what do you think of this new set of changes? Outraged? Indifferent? 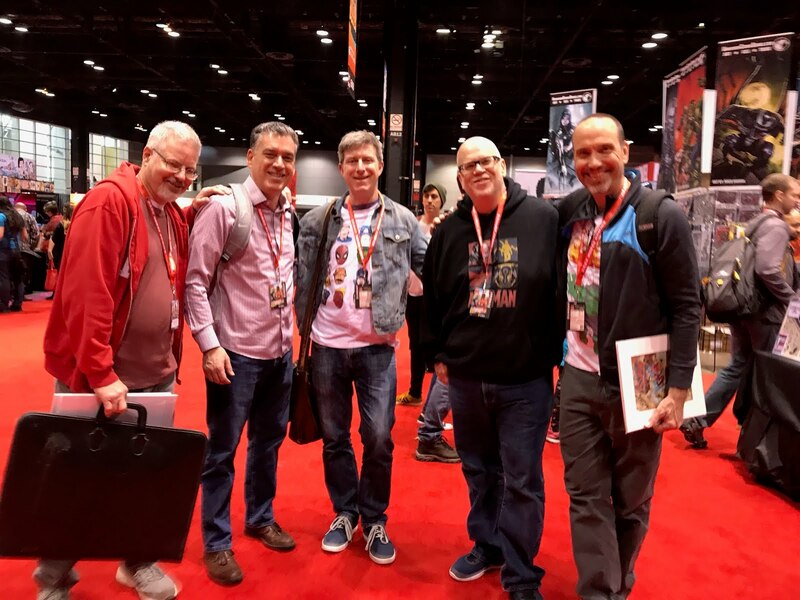 Follow the Leader Episode 121: Prequels; Yay or Nay? 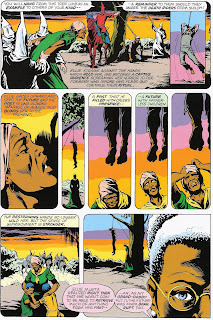 April 25th, 1979 - Marvel UK, 40 years ago this week.